DAHLGREN, Va., Oct. 6, 2010 — Defense contractor Northrop Grumman Corp. reports its maritime laser system now shows "higher lethality" at longer ranges, after a system test resulted in several laser burns through small sections of a boat located across the Potomac River. The laser created the holes while on land at the Potomac River Test Range. Northrop Grumman said the tests of the US Navy's Maritime Laser Demonstration (MLD) system, conducted in late August and early September, confirm the laser weapon system's readiness to proceed with at-sea testing later this year. "We have shown that the Maritime Laser Demonstrator's design is as lethal at longer ranges as other previously demonstrated approaches," said Steve Hixson, vice president of Advanced Concepts, Space and Directed Energy Systems for Northrop Grumman's Aerospace Systems sector. Hixson said Northrop optimized the MLD's design to make it more lethal at longer ranges while using less laser power than other approaches. "This means we can defeat threats at longer ranges using less electric power from a ship and with a smaller, more affordable weapon," he said. The MLD laser weapon is based on mature technologies developed through several Defense Department programs, Hixson said, such as the precision tracking system from the Tactical High Energy Laser (THEL), which destroyed some 46 rockets, artillery and mortars in flight. The MLD laser weapon also features the high-brightness, solid-state laser technology from the Joint High Power Solid State Laser (JHPSSL) program, which was provided by the Office of the Secretary of Defense, High Energy Laser Joint Technology Office in Arlington, Va., and the US Army Space and Missile Defense Command/Army Forces Strategic Command in Huntsville, Ala. Northrop Grumman was the prime contractor for THEL and JHPSSL. 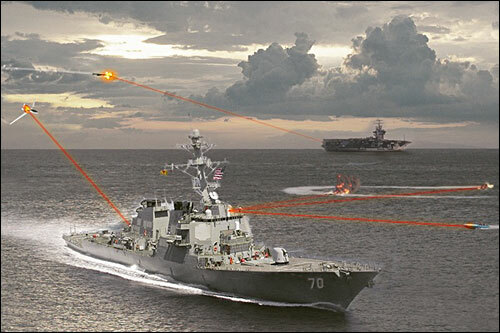 Northrop is developing MLD for the Office of Naval Research with a goal of demonstrating the readiness of solid-state laser weapon systems to begin transition to the fleet to engage targets that challenge current defensive systems such as swarms of enemy fast patrol boats. The "static land" tests were conducted at the Naval Surface Warfare Center's Dahlgren, Va., division, where it operates the Potomac River Test Range, the nation's largest, fully-instrumented, over-the-water firing range. Such tests in marine or coastal conditions are essential because weapon systems and sensors function differently over water than over land. "Unlike commercial lasers that form the core of some laser systems intended for use at sea, MLD's power levels can be scaled to 100 kilowatts and beyond to defend ships from a wider variety of threats," said Dan Wildt, vice president, Directed Energy Systems for Northrop Grumman. MLD is a multiple kilowatt, high-energy system for the purposes of the current demonstration phase. "Another advantage of our approach is a modular architecture system that makes upgrades easy as subsystem technology advances," he said. "This allows MLD to use any laser. Competing approaches are performance-limited by their use of gun-mounted beam directors, commercial lasers and less accurate tracking systems."